1. In medium bowl, whisk together garlic, lime juice, 6 tablespoons oil, 1 tablespoon cilantro, coriander, red pepper flakes, salt and black pepper. Place chicken in large zip-top plastic bag. Pour 1/2 cup marinade over chicken. Seal bag and refrigerate 1 hour to marinate. 2. Prepare rice as label directs. 3. Meanwhile, remove chicken from marinade; discard marinade. Heat large skillet or wok over high heat. Add remaining 1 tablespoon oil and chicken, and cook 4 minutes, stirring occasionally. Add bell peppers and jalapeño, and cook 3 to 4 minutes or until peppers are tender-crisp, stirring occasionally. Stir in green onions, remaining 1/2 tablespoon cilantro and remaining marinade. Cook 1 minute, stirring. Add orange segments and cook just until chicken loses its pink color throughout and internal temperature reaches 165°, stirring occasionally. 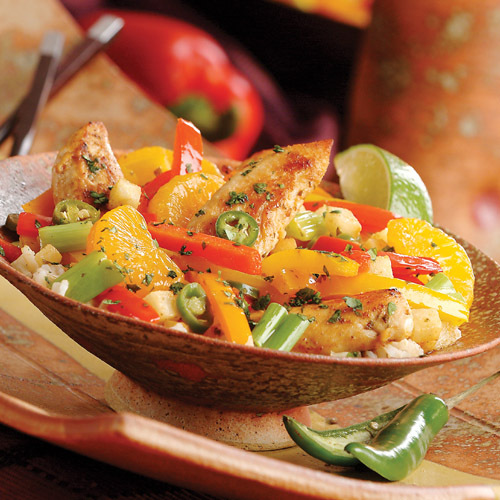 Serve stir-fry over rice, garnished with cilantro and lime wedges, if desired. Try substituting fresh Mandarin orange segments (tangerines, clementines, etc.) in place of canned. Stir-frying is a healthy cooking method in which small pieces of food are cooked quickly over high heat in a small amount of oil, preserving the crisp textures, bright colors and nutrients of the vegetables.